This is a hilly run with a great reward! The views from the Piazzale Michelangelo are spectacular. 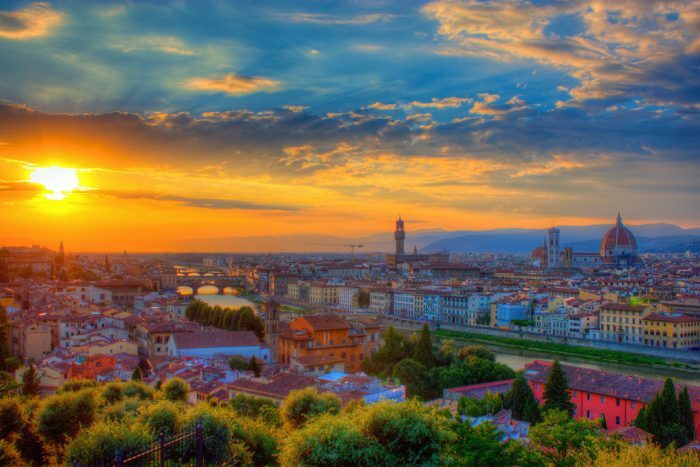 One can put together a wonderful run from central Florence, where there are several options to run up to the Piazzale. Our favored route is to run up the windy Viale Michelangelo, and then down from the backside of the Piazzale using Viale Galileo Galilei and then the gorgeous Via di San Leonardo, for a 7.7 km loop. Start at Ponte alle Grazie. Run along the south side of the Arno, to the the Ponte S. Niccolò, and then up the winding Viale Michelangelo to the Piazzale Michelangelo. Once at the Piazzale, enjoy the view. From the back of the observation deck, head out Viale Galileo Galilei, past the hilltop Abbazia di San Miniato al Monte, for about 1.5 km, and then turn RIGHT on Via di San Leonardo. After another 1 km, pass the 15th century hilltop fortress of Forte di Belvedere and the Giardino Bardini, a restored 17th-century villa smuseums & art and gardens. Follow until you reach the main road at the river, at the Piazza. Conclude your run by turning right to get back to the Ponte alle Grazie, or cross over the Ponte Vecchio and then turn right for 0.5 km back to the start. Add-Ons/Variations: For the Piazzalle, can run more directly back down, using Viale Giuseppe Poggi (sections no sidewalks). At the Piazzalle, there are numerous small roads which are fun for running. Can also extend with paths along the river.